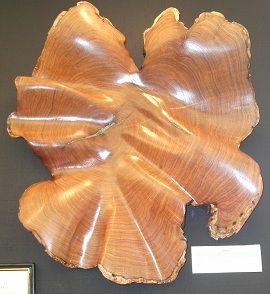 I finally took pictures of this gorgeous black walnut rocker that is here at the AZ Fine Art show. The figure in this rocker is just incredible. 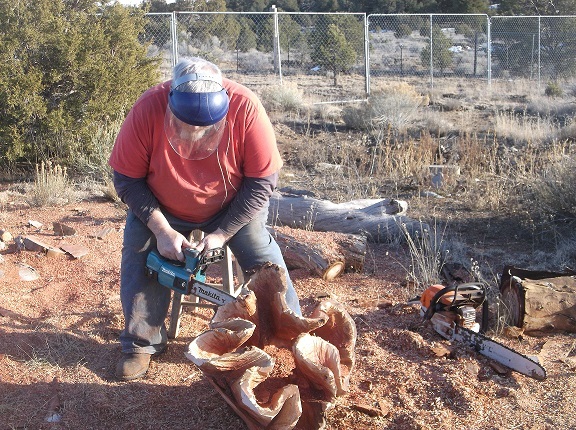 We have been very happy with this wood and have made a few rockers out of it. This new design, “Shangrila II” features the flexible back and they have been a huge hit since we started making them. 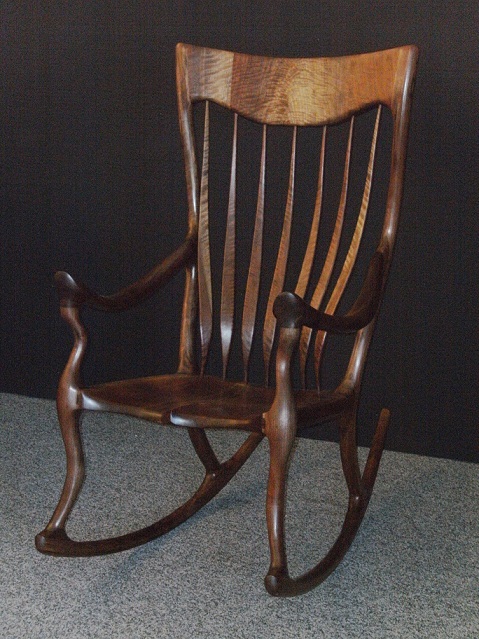 We have been perfecting them since we first made them and I do believe they make the overall comfort of this rocker design far supperior to any out there. 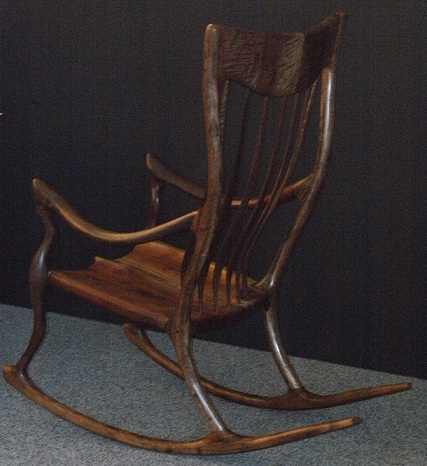 Here is a side shot of the rocker. 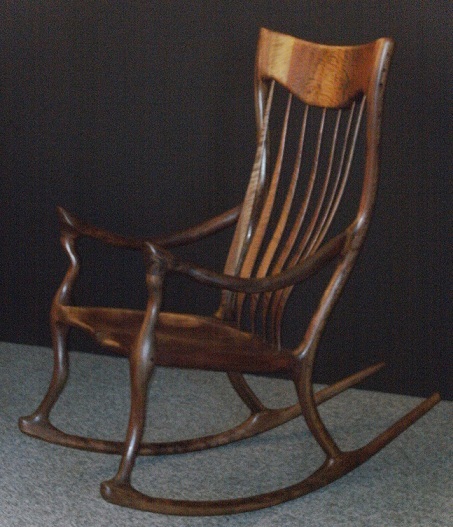 Notice all the beautiful curves this rocker has. It is very artistic to look at. Wish this back shot was better quality so the figure in the headrest showed up better. But even in this picture you can see how beautiful it is. 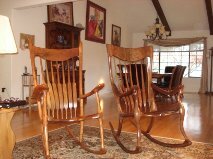 Here are two rockers happily in their new California home. 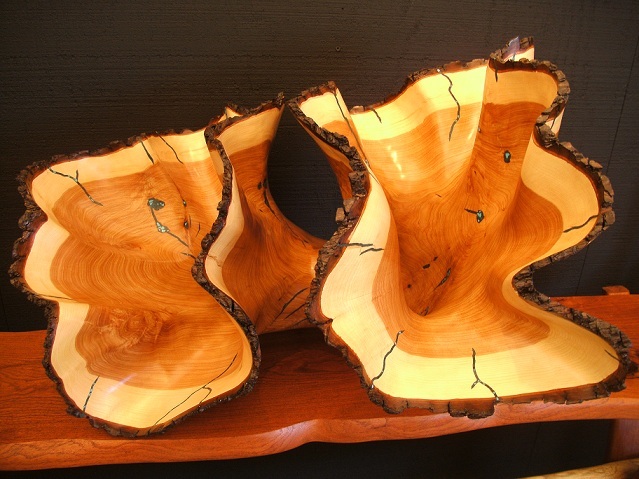 The one on the left is a Maloof inspired design out of mesquite and walnut. 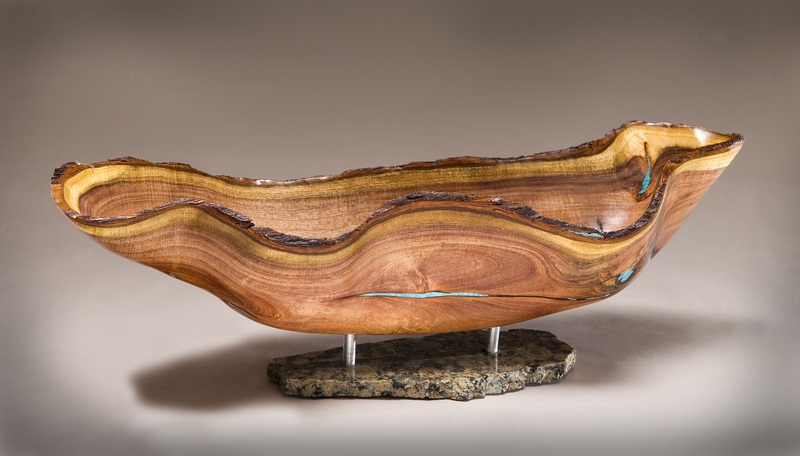 The one on the right is our Shangrila II rocker out of that gorgeous black walnut. 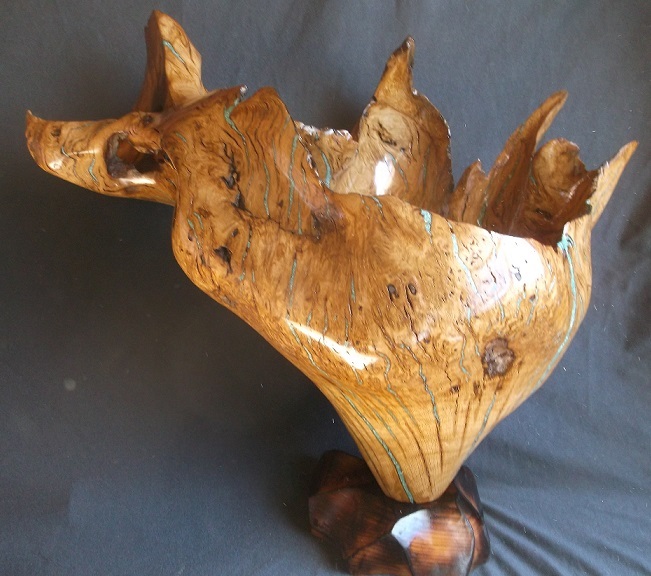 “Forest Reef” is made from an approximate 800 year old Alligator Juniper tree. 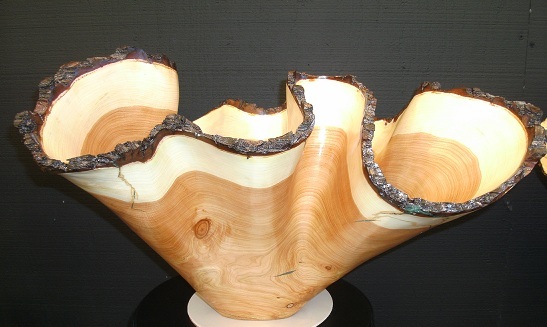 This piece has gotten the most attention at the show. It is 30″ long, 24″ wide and 19″ deep. Scott tunneled out the middle and created a bridge as you can see in this photo. 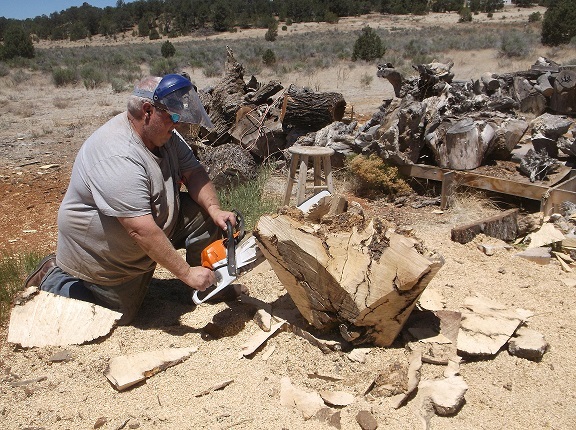 Yes he used the chainsaw first to remove most of the wood, being very careful to leave the bark in tact. 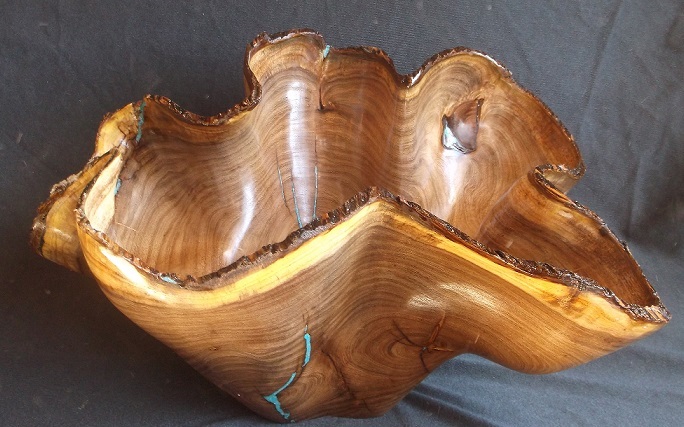 I inlaid turquoise into the natural cracks and then many hours of sanding later, this beauty was complete. It resembled a coral reef, so I looked up different names for reefs and found one called “Forest Reef”. It was meant to be. You have to see this in person to truly appreciate it’s size and beauty. 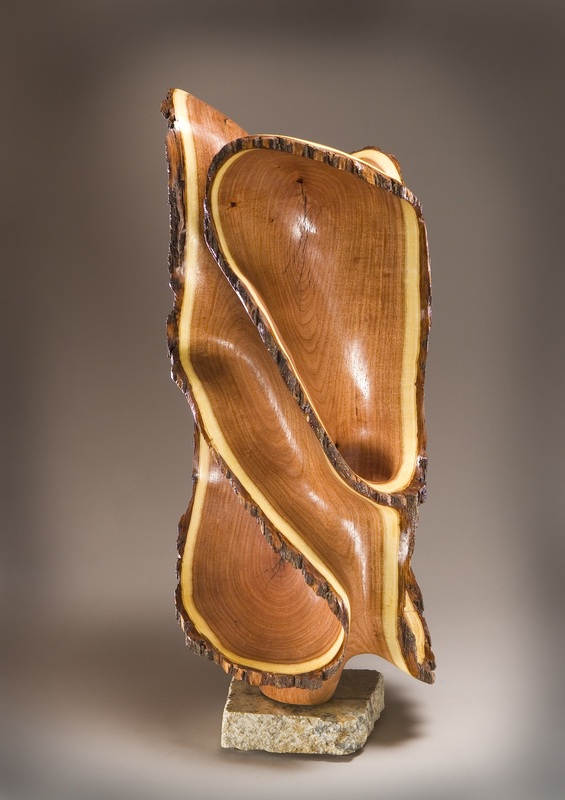 “Tango” is a mesquite wall piece that has some gentle waves and bends carved into it. 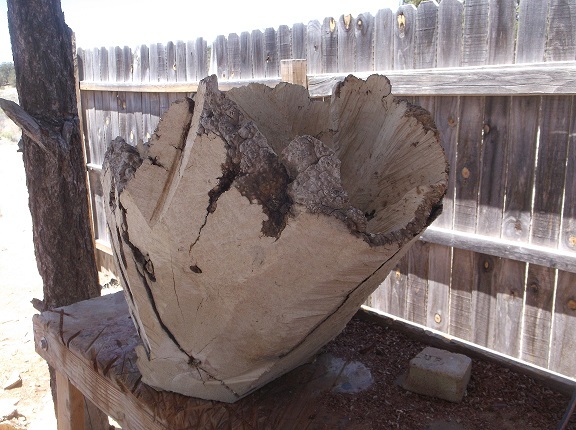 It came from a large block of mesquite, so we were able to keep some of the natural shape and sap wood in it. 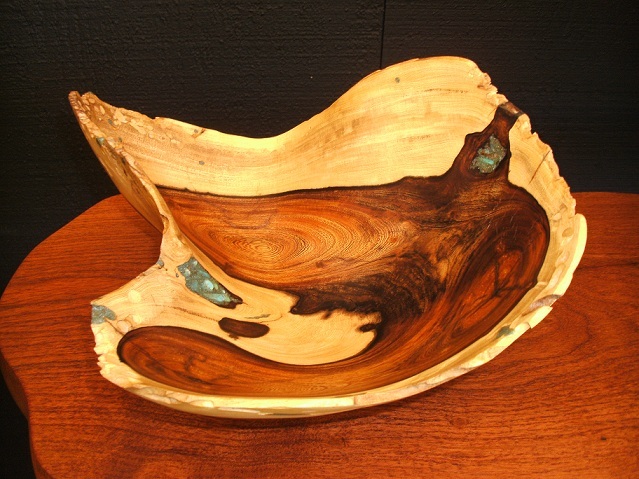 I inlaid turquoise into some of the natural cracks to add a splash of southwest color. It is 27″x22″. This is a new wood that we haven’t worked with before. 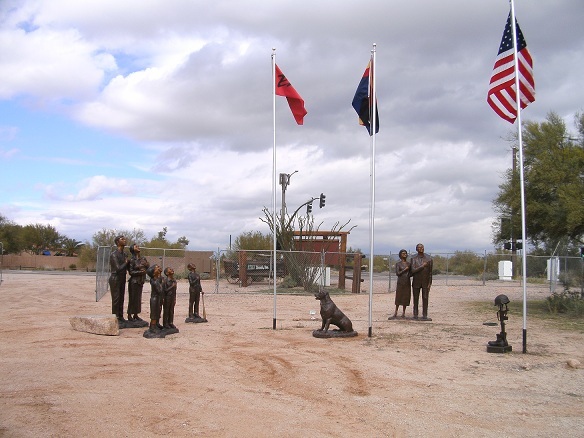 Ironwood. 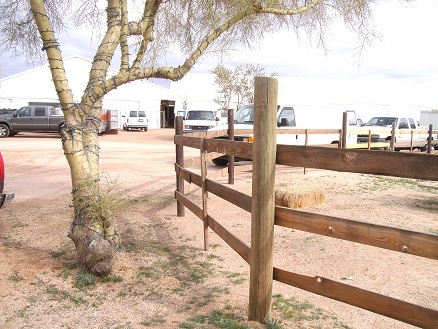 And there is a reason they call it Ironwood. It’s as heavy as a metal iron. 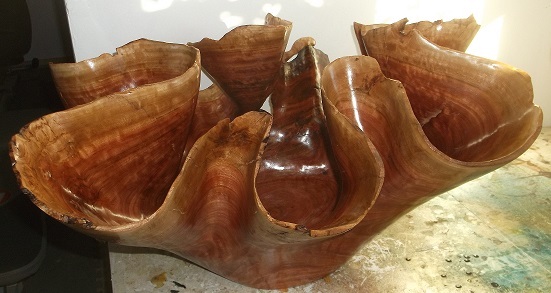 We thought we’d give it a try to see how it worked and we also needed more smaller pieces, since we sold our other smaller carved bowls. 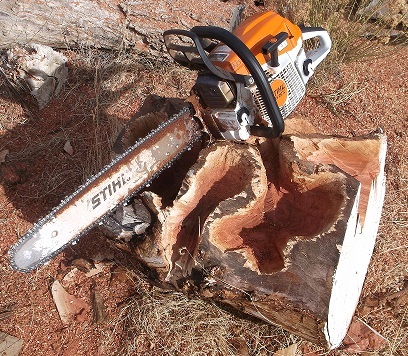 So we rescued a few logs from the fire pit here and went to work. 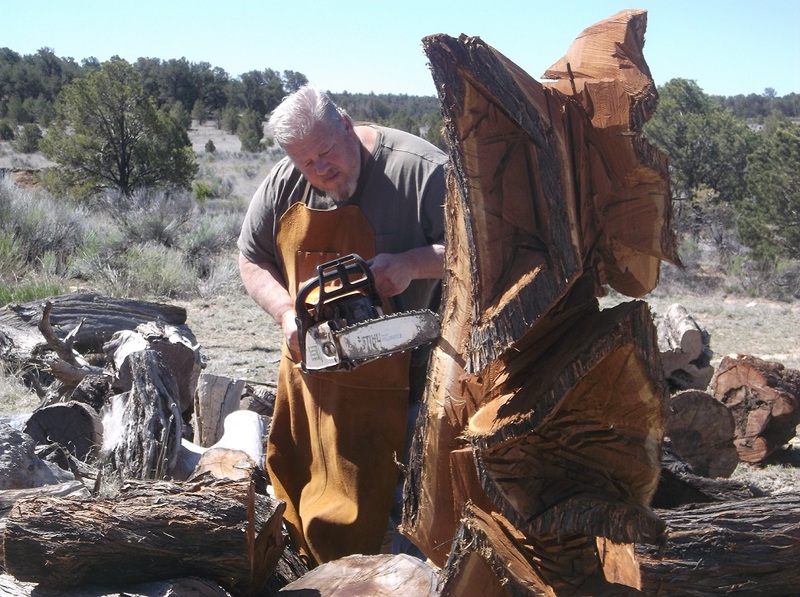 Even though Scott didn’t have his big chainsaw, he was able to create a few. It took longer, but they turned out just wonderful. The grain patterns going from the almost black, to brown and then to the blonde are just beautiful. We’d get one coat of finish on them and they’d already have a buyer. They were willing to wait for them to be completely done to get them. We will definately be creating more pieces out of this. 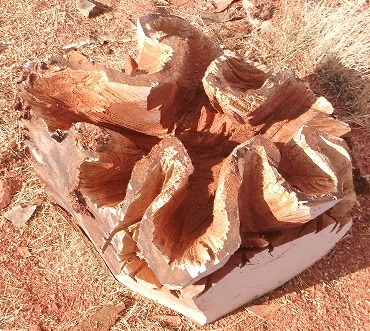 Especially some larger sculptural ones. So keep an eye out for these beauties. 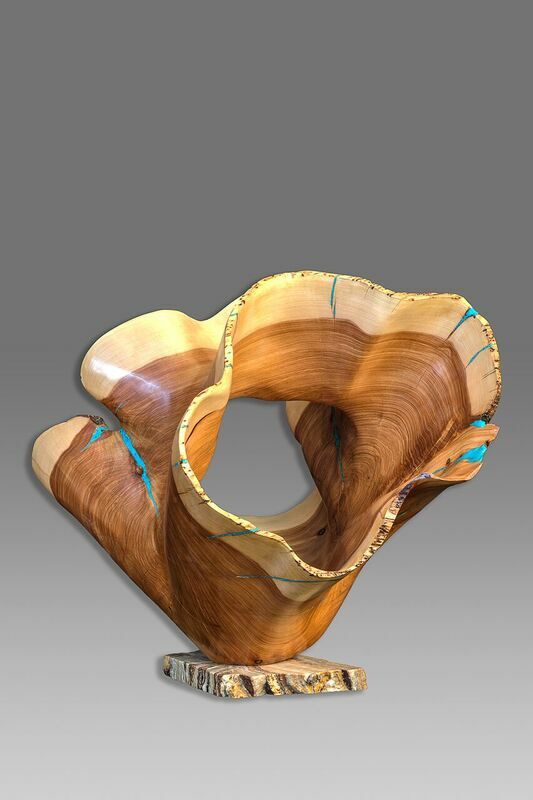 Well opening day is here for the Arizona Fine Art Expo. The last few days have been a whirl wind of artists setting up their booths. Now that the show has opened, booths are all set up (with maybe a few minor things to do) and artists are getting their selling caps on. 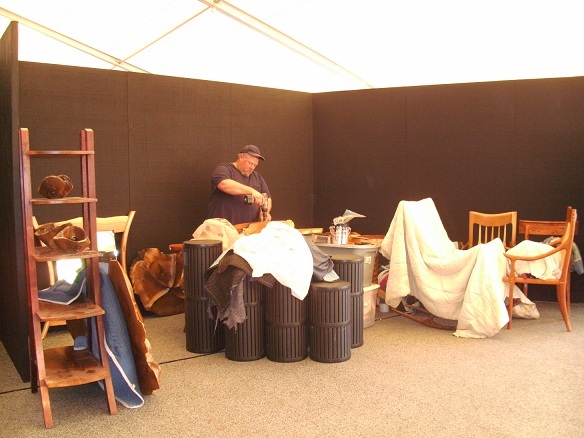 Many booths are setup so that the artist can still work and create (mainly painters), so as to still be able to add new pieces to the booth over the 10 week period. 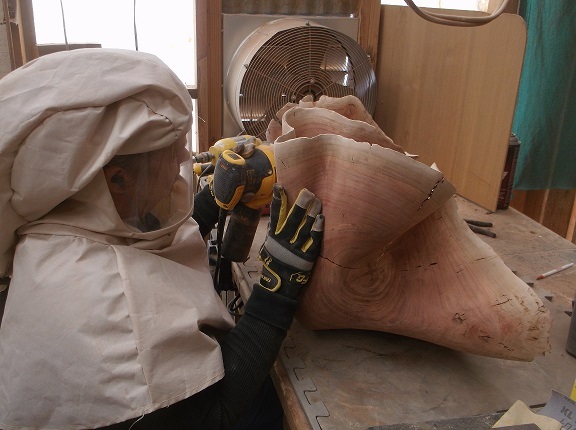 We opted to pay more for an outside working cabana, where we can still do some carving with grinders, hand shaping, sanding and other work. I have it setup in the booth to work on the computer, as I’m doing now, and do some inlaying. Sampson is all settled in the rv, which is right outside of the show, so we can go check on him and spend some quality time with him. He’s such a baby and doesn’t like it when we’re away from him. 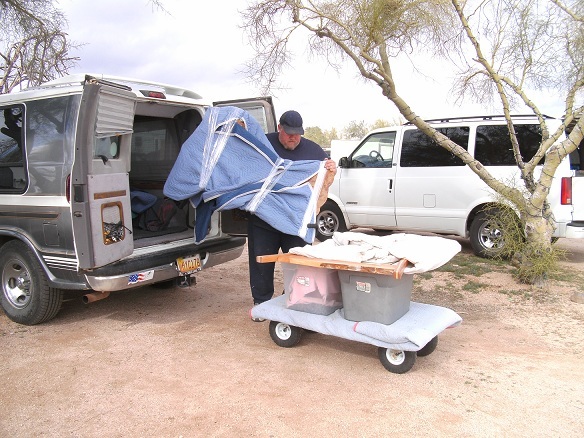 Scott is in the process of building a ramp so Sampson along with us, can get in and out of the rv with ease. Poor guy is getting old and can’t get up and down as easily. The weather has been just beautiful. Much warmer than back home, and it has been great sitting outside with Sampson and wearing short sleeves. We are officially Snowbirds. Till April 4th at least. Below are some pictures of the booth setup and a great final shot of everything in the booth. We are very proud of how nice the booth looks and have gotten lots of compliments so far. We still have to setup the working cabana to enable us to start working. Scott is going to build some work benches, but it will mainly be open, so people can watch us work. We will be posting on facebook a tentative weekly work schedule, incase people wish to come and see a particular project. 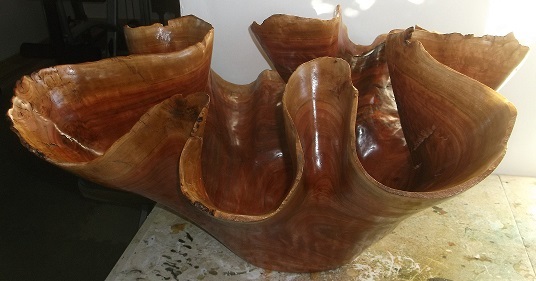 First on the schedule, once the cabana is up and running is to finish a large sculpture piece “Forest Reef”. 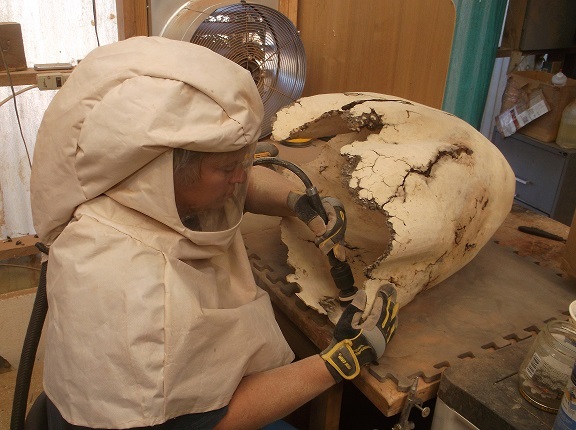 Just the final sanding and finishing is all that is needed. In the meantime it sits in our booth to show people different stages of creating a sculpture. Next we will be finishing up “Twisters Cousin”. 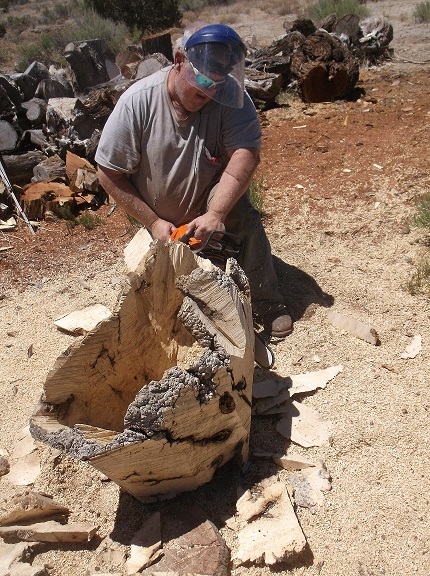 Scott started carving a smaller version of our 5ft sculpture “Twister” before we headed out to the show. He still has some grinding to do to it, then I will have hours of inlaying, sanding and then finally the finish will be applied. We plan to work on this piece the last weekend of January when a TV News crew will be here filming. Hopefully it will get us some more publicity. 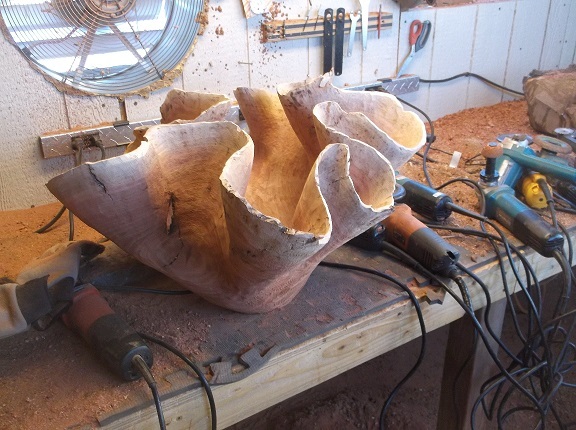 Other projects that will be on schedule are barstools, chairs and other carved sculpture pieces. So follow us on Face Book to see our work schedule and updated photos of everything going on. 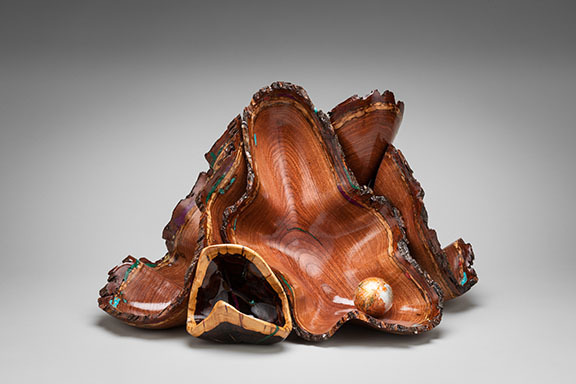 Also happening next weekend is the opening of the Mesa Museum Contemporary Crafts Exhibit. The opening reception is friday January 27th 6-8pm in Mesa AZ and is free to the public. 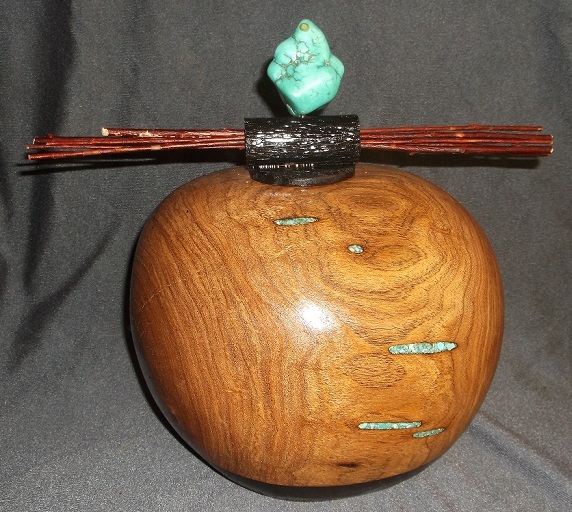 We have two pieces on exhibit (Bentwood Rocker and carved vessel). 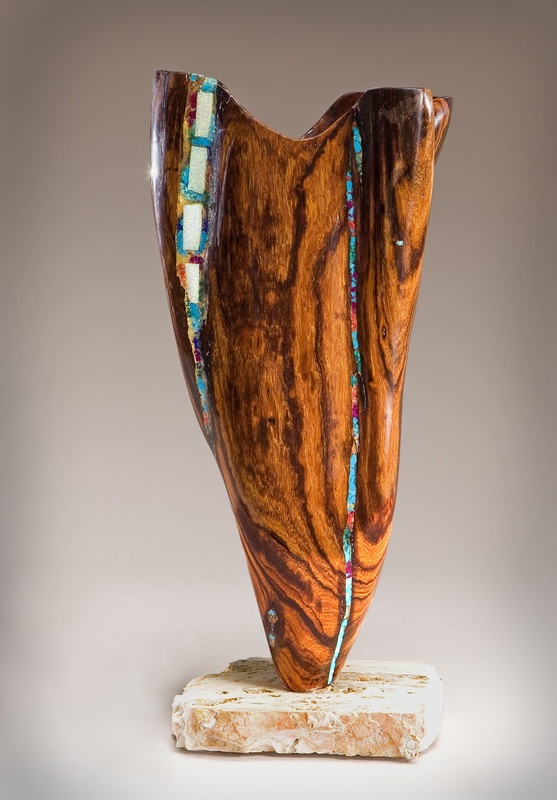 There are 50 pieces from 36 artists that will be on display from January 27-March 18. We received our invitation the other day and our carved vessel is proudly displayed on the cover. So that was a big surprise. 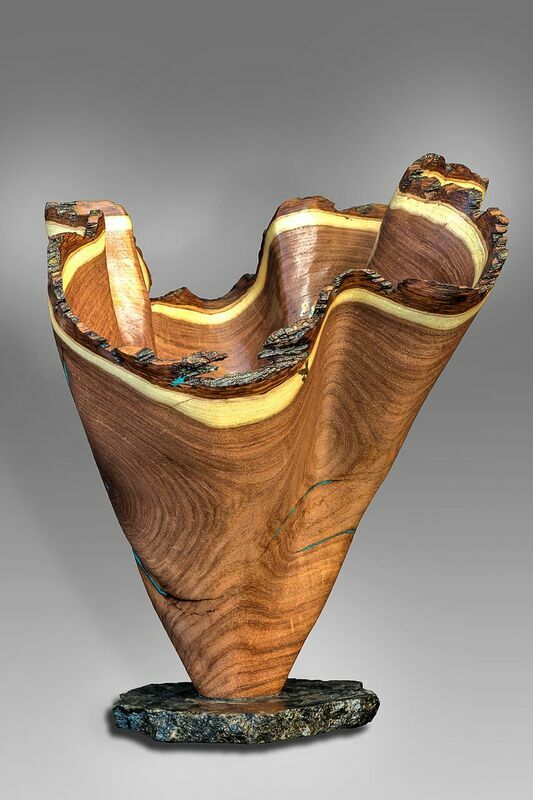 We also had some publicity for this exhibit in the most recent Woodworkers West Magazine. 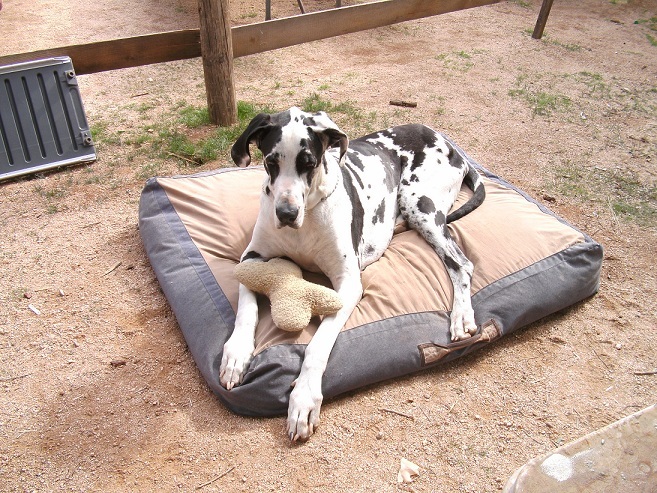 Of course we have to show a picture of Sampson. Here he is laying outside the rv with his squeaky toy. He’s really enjoying being able to sit outside and soak up the warm sun. No snow or -22 temps. This is the life. This is a view from our rv looking at the show tent. Artists have pulled up to unload. Scott is unloading a wall piece. Starting to setup the booth. It seemed to take forever. But I guess when you have three days to do it, you find yourself not rushing. The lighting took quite a while, since we had never done that kind of setup before. 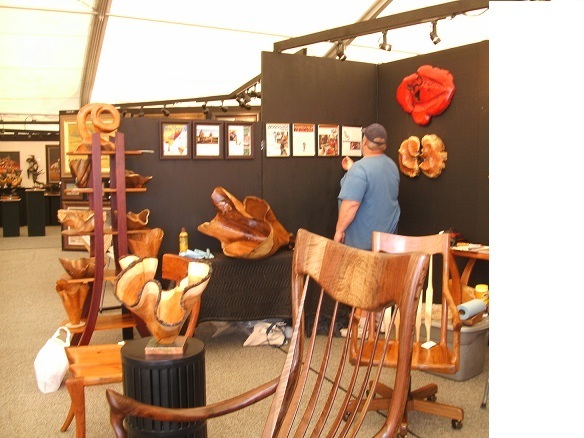 Here Scott is displaying our most recent articles from NM Magazine and Woodshop news. Everythings been polished and we’re almost done. Booth is complete. Turned out really good. We have quite a selection. This patriotic setup is out in the sculpture garden. This is one of my favorites so far. There is quite a bit of sculptures out in the garden, along with a sitting area and a koi pond. Inside the large tent is a cafe with some great food and sitting. Along with some fabulous art. 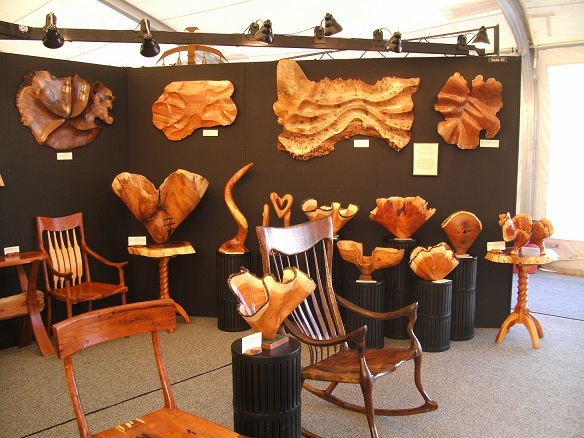 Here are a few new pieces that we have displayed in our booth. To see more, please email and I’ll send you photos and info. Or better yet, stop by if your in the Scottsdale area. 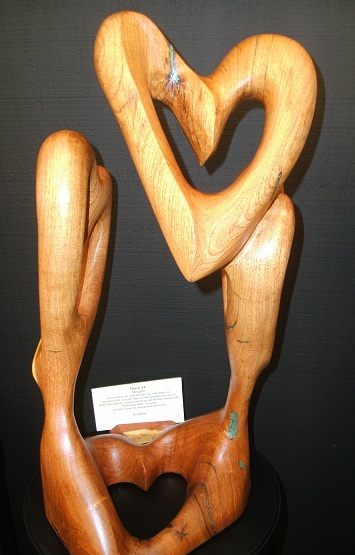 “Achy Breaky Heart” is one of our newest pieces, this was carved from a very large mesquite and stands 30″ Tall and is 38″ wide. The middle was two trunks growing together and they started splitting apart. So Scott stitched it up with wenge pieces. It then took on a whole different look and meaning. 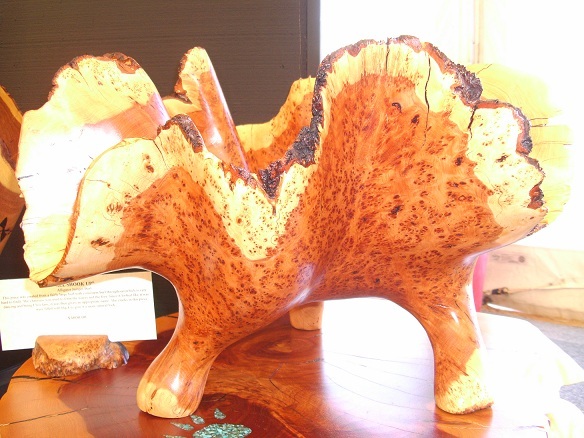 “All Shook Up” is an Alligator Juniper Burl. 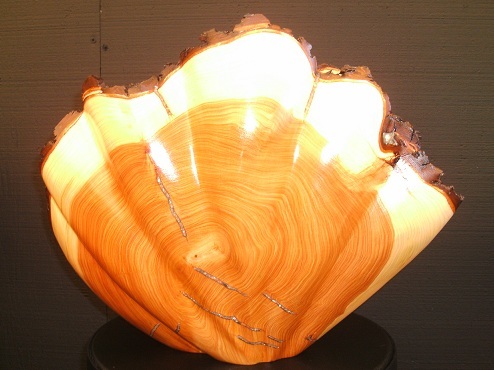 The picture does not do this gorgeous burl justice. 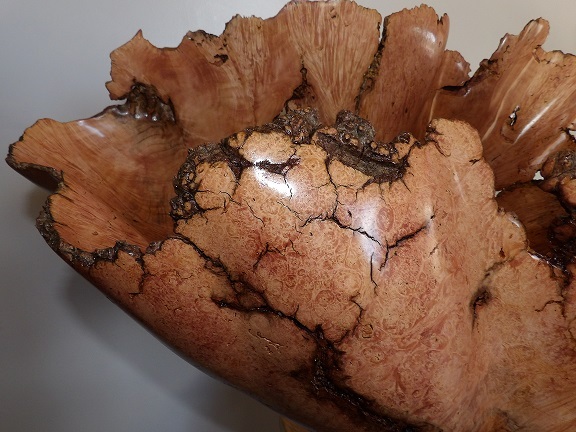 It is approximately 12″ tall and 18″ diameter, which is a large burl. 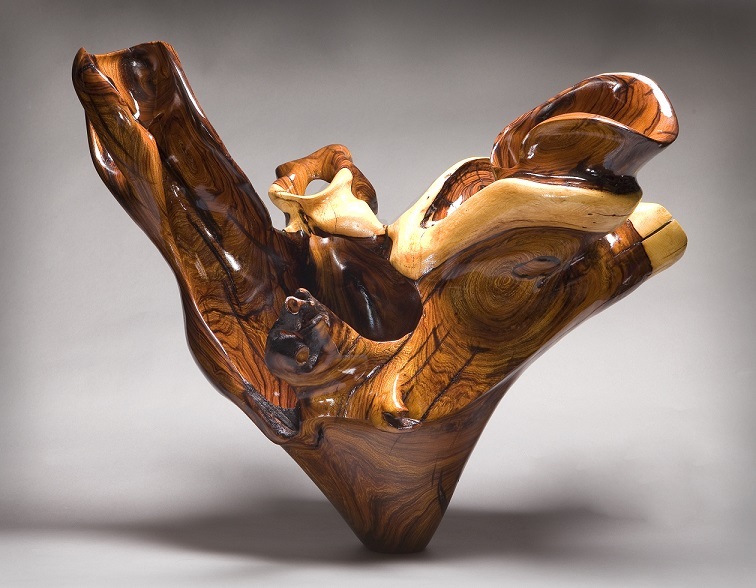 The burl figure on this piece is incredible. 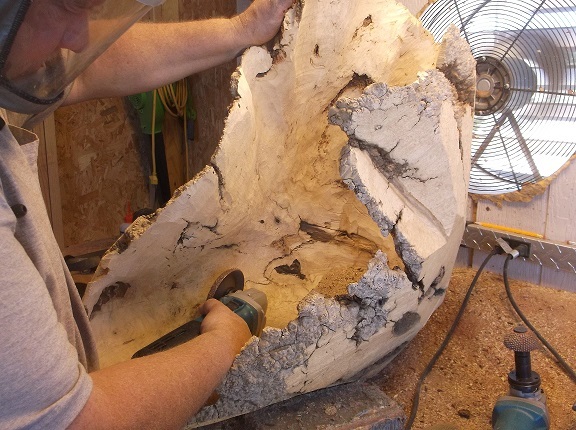 Scott carved waves into the top leaving some of the bark inclusions and then carved feet. 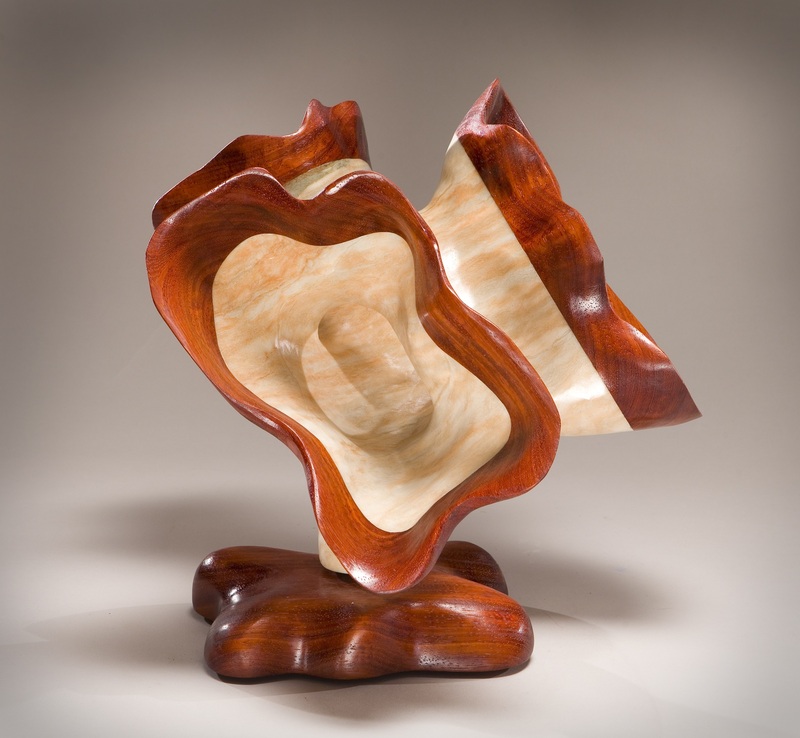 This piece looks like its dancing. So being Elvis fans, it was appropriately named. 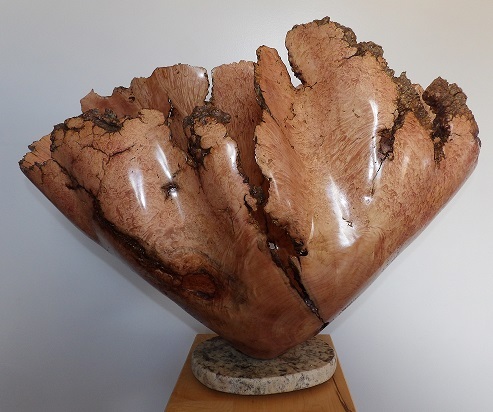 “Ancient Waves” is a large English Walnut Burl that has gentle waves carved into it and two fossils inlayed. 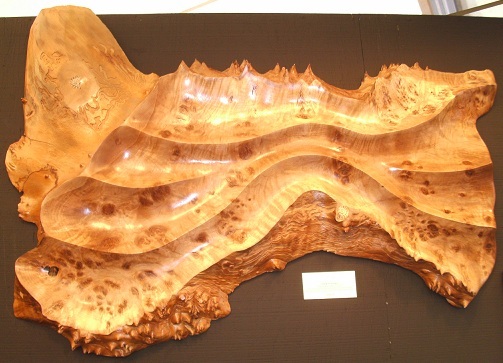 The wood speaks for itself in this magnificent wall piece. 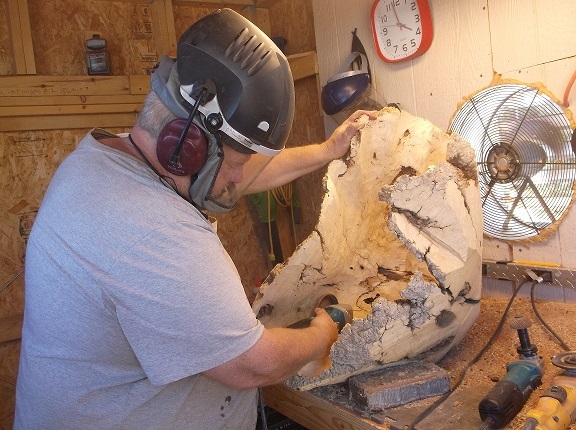 “Hearts 4 You” is one of my favorites, because watching Scott carve it was fun and amazing. 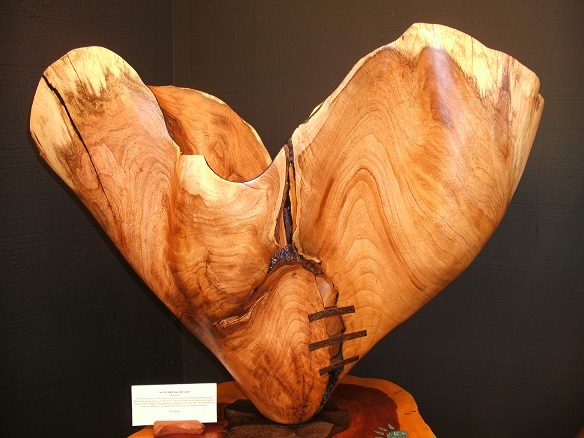 Carved from one mesquite log, he carefully created four hearts into this piece, thus the name. I inlayed turquoise into some of the cracks to add a splash of color. 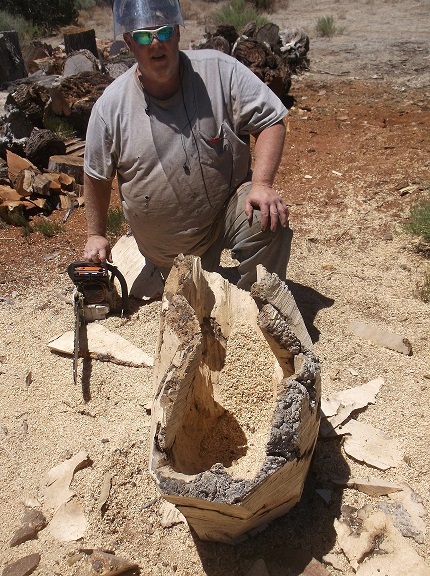 Hard to believe he used a chainsaw to create this. 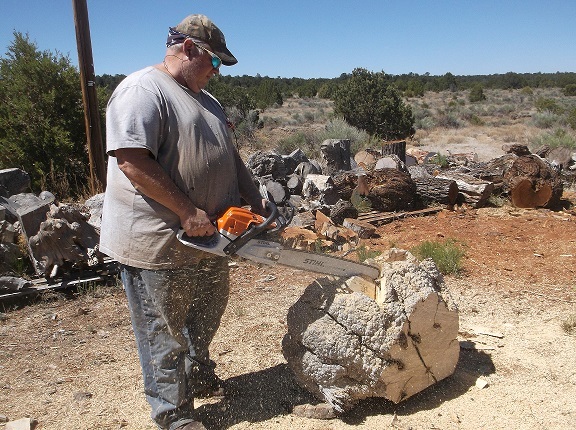 “Clam it Up” was made from Alligator Juniper. 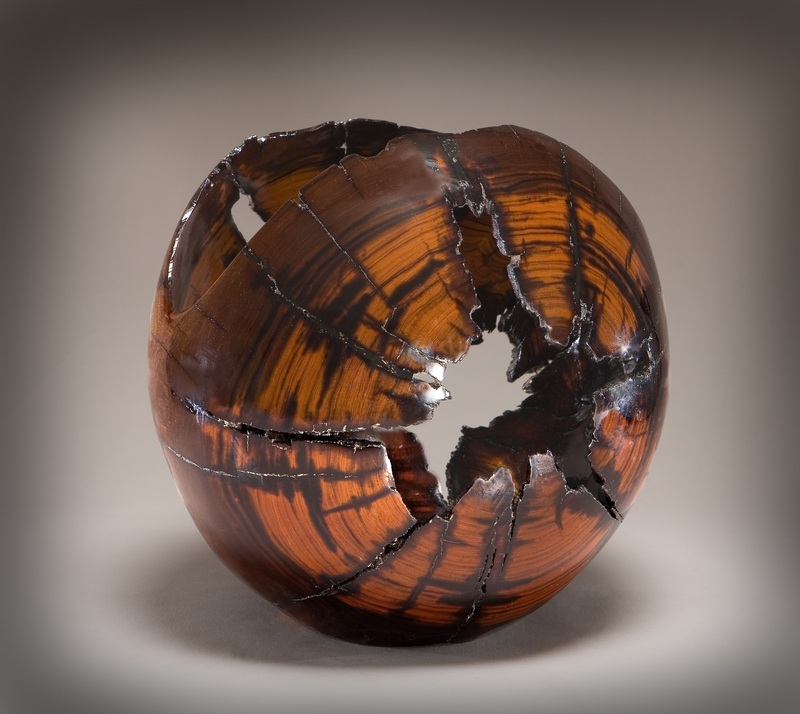 It resembles a clam shell and has abalone shell inlayed into the cracks. 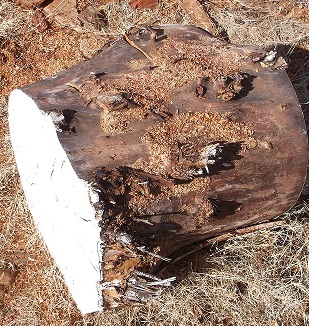 “Outer Limits” is also Alligator Juniper. 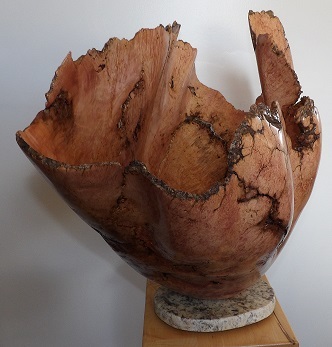 Being careful to leave the bark in tact and get some beautiful folds in it was quite a challenge. 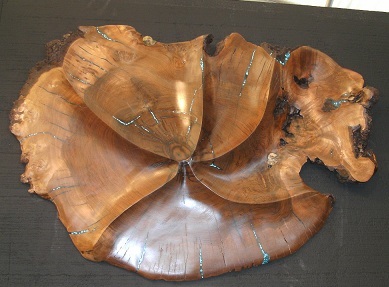 “Hondo” is a Black Walnut wall piece. 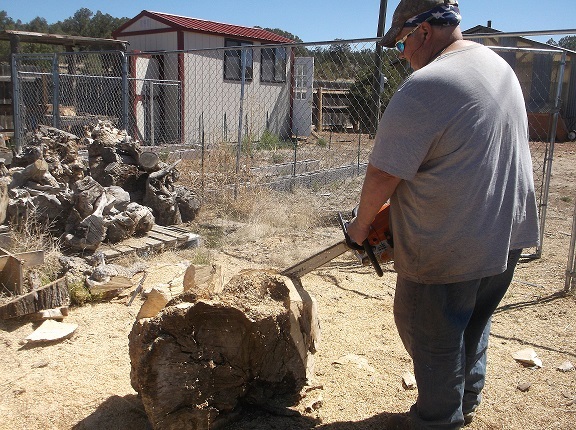 The walnut came from the Hondo Valley near Ruidoso. 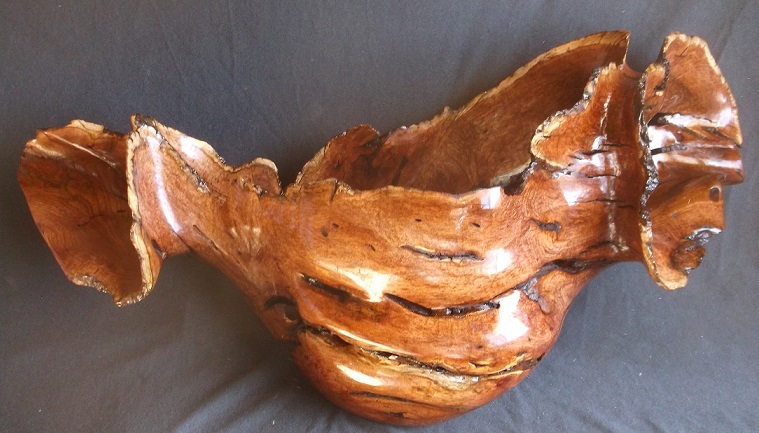 It has some beautiful dark to light tones and the carving brings that out. I inlayed turquoise and fossils into this piece. “Haley’s Comet” adds a bold splash of color to our wall. 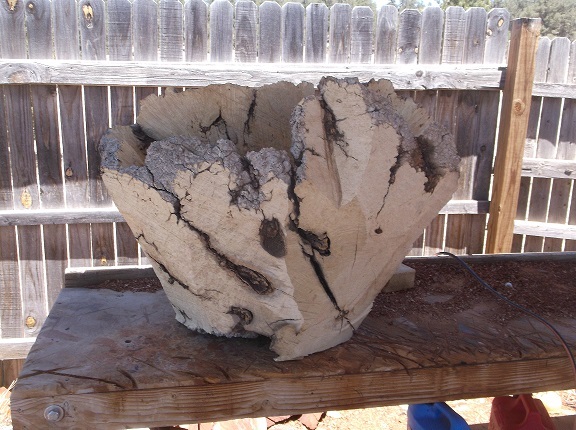 It was made from Box Elder Burl and has chainsaw hash marks created into it. 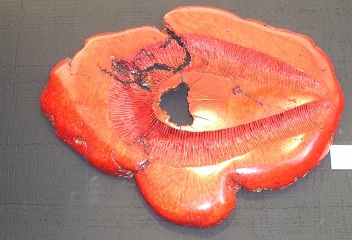 Since the burl wasn’t popping out enough for us, we decided to take a chance and dye it red. So far it has been a real hit. Next update I’ll post pictures of the show events, other artists and more. So stay tuned.